For those insureds that live in colder climates and are not taking their vessel south for the winter its time to start the decommissioning process. If it moves, grease it. Lubricate all moving parts to ensure they remain that way until spring. If it could freeze, protect it either with antifreeze or by aerating the whole system. Be sure any fuel stabilizer or treatment makes it all the way through the fuel system to the engine. In the spring you want to ensure that your vessel has been properly inspected to cover items sometimes overlooked such as drain plugs in the transom. It is recommended that you make a list of items you find from your winterization, so that your readiness in the spring goes smoothly. REMEMBER, manufacturers often have their own recommendations for winterization. Typically the marina or yacht club you choose to store your boat will have the ability, at a cost, to ensure that a vessel has been correctly prepared for winter and spring commissioning. You can speak to your marina or local boat dealer/broker to learn about boat storage. 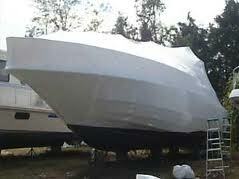 Finally, the internet has thousands of different websites and sources of information on boating and boat storage.